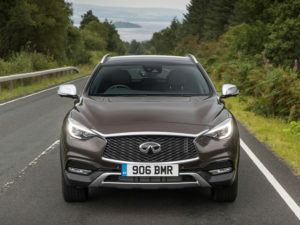 Infiniti has implemented a new trim level structure for its Q30 compact hatchback and QX30 crossover models intended to simplify the line-ups. For the 2018 Q30, the line-up brings an entry-level Pure trim, which replaces the SE, as well as Luxe/Luxe Tech and Sport/Sport Tech offshoots that bring a more luxury or sport-focused approach. Standard kit on the Pure trim includes forward collision avoidance, automatic headlamps, LED running lamps, Bluetooth audio streaming and multi-function leather steering wheel. Both the Luxe and Sport trims offer more engine choices, along with InTouch navigation and 18-inch and 19-inch alloys respectively, as well as lane departure warning. Luxe Tech and Sport Tech trims bring DAB radio, intelligent cruise control and blind spot warning as well as Around View Monitor with Moving Object Detection. Q30 Sport and Sport Tech versions also bring sports bumpers with a diffuser at the back and a 20mm lower ride height on the 2.0-litre petrol and 2.2-litre diesel engine versions. The 2018 QX30 comes with Luxe and Luxe Tech features and brings new design features, including optional 19-inch alloys. The new Q30 and QX30 are available to order now and will be in showrooms as of March 2018.